Billy Ochoa teaches Spanish at CELC Middle School, via Skype from Guatemala. In Guatemala, he works directly with an organization called EducArte, supporting youth who cannot afford to attend school. 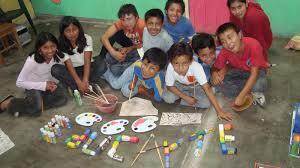 EducArte brings education and many health and community servcies to youth and their families. 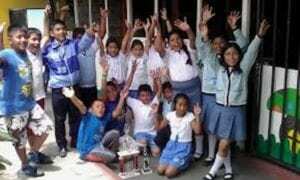 This fundraiser is designed to help Billy and EducArte raise the $350.00 to allow his students to attend The Chitic Parade Stilt Millenary Dance. Please consider making a donation by 1 December 2018 – any amount toward this goal is greatly appreciated! The Chitic Parade brings together different social, cultural, and artistic organizations for youth and children in Mesoamerica to strengthen the movement of living community cultures. In this event various artistic workshops are developed with playful methodologies and coexistence, facilitated by organizations in Guatemala. Urban Art, ancestral toys, body expression, and public play are some of the expressions shared by hundreds of young people. EducArte Community Center will participate for the first time with a festive parade in which children will be able to share their creativity and skills for handling stilts. For several weeks and through various workshops we have created our Parade with stilts, dance, and music. Ten students will participate; they feel very excited because it is the first time they will dance with stilts. In Antigua Guatemala and Ciudad Vieja, there are no stilt walkers, which means that these students are the first to do it! The travel to Xela is important for the community. It is the first time that we are going to make this trip; we will sleep in downtown; it feels like a big adventure. We have two young volunteers who will make a video about all this adventure. We will plan to share this video with all of our supporters. These travel experiences change lives – in the beginning the students were afraid to be on stilts. They all worked hard and now feel greater confidence in themselves. They feel very excited to show the community their skills. Please make a donation by 1 December 2018 in support of Billy and these students. Check can be made to “CELC” and given directly to Maria or Melinda, or it can be mailed to CELC, 28 School Street, Branford, CT 06405. All funds go directly to support this project with EducArte. Contact Maria or Melinda for more information. mandm@CTExperiential.org or call 203.433.4658.